As many of us in the midwest know, it’s going to be absolutely frigid this week and many of us will be stuck indoors. That doesn’t mean that you have to miss out on a workout. Isometric exercises are a great way you can do some strength training anywhere you have chair! So, you have no excuse! Isometric exercises are safe and effective and are great for people that have injuries that aren’t able to lift heavy weights. They can be done at your desk at work, while you wait for your train, in a doctor’s office, on a plane….you get the idea. You might get some strange looks, but who cares! You’re working toward your fitness goals and that means much more than what other people think. This isn’t to replace a full strength training workout at a gym or if you’re my client, this definitely doesn’t replace our sessions… but it is way better than doing nothing! POSITION: Sitting in a Chair with Knees at a 90 Degree Angle, Head Neutral, Tall Posture with Shoulders Back, Feet are Hip Width Apart. WORKOUT: Press heel(s) into the floor for 30 seconds for novice, 1 minute for intermediate, 1-2 minutes for advanced. You can do both legs at the same time or you can do one and switch back to the other. REPEAT TWICE. WORKOUT: Straighten one arm and press heel of palm into chair and squeeze lat and tricep muscles for 30 seconds for novice, 1 minute for intermediate and 1-2 minutes for advanced. Switch arms. REPEAT TWICE. POSITION: Sitting on Edge of Chair Bent Down, Left Elbow Touching Right Knee, Back Straight, Right Arm Relaxed. WORKOUT: Press elbow into knee while engaging the core. Press for 30 seconds for novice, 1 minute for intermediate and 1-2 minutes for advanced. Switch sides. REPEAT TWICE. POSITION: Sitting on Edge of Chair, Slightly Bent Over with Straight Back, Left Elbow Resting 90 Degrees on the Inside of the Left Knee, Palms Flat, Right Arm Bent 90 Degrees Pressing Right Palm into the Left Palm. WORKOUT: Press palms together engaging the left bicep. Squeeze for 30 seconds for novice, 1 minute for intermediate and 1-2 minutes for advanced. Switch arms. REPEAT TWICE. 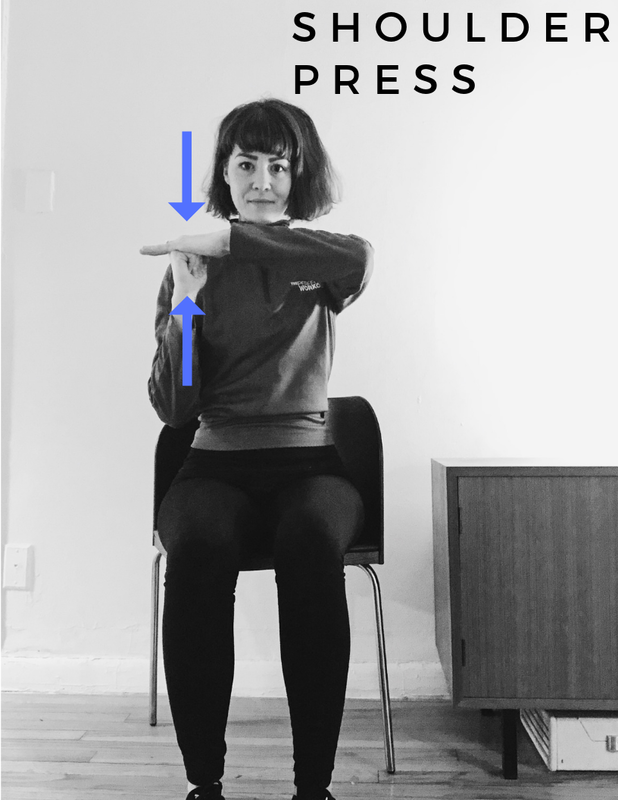 POSITION: Sitting in a Chair with Knees at a 90 Degree Angle, Head Neutral, Tall Posture with Shoulders Back, Feet are Hip Width Apart, Elbows Out in 45 Degree Angle. WORKOUT: Press palms together and squeeze chest muscles, keeping core engaged as well. Squeeze for 30 seconds for novice, 1 minute for intermediate and 1-2 minutes for advanced. REPEAT TWICE. WORKOUT: Engage core, bend right arm by your side with your fist up, bring left arm up in 90 degree angle. Left palm to top of your fist, squeeze your right shoulder muscles as you press up into your palm. Squeeze for 30 second for novice, 1 minute for intermediate and 1-2 minutes for advanced. REPEAT TWICE. WORKOUT: Bend and lift your left elbow to approximately eye level. Make a fist with your left hand. Place your right palm on top of your left fist. Press with your left fist and right palm. Squeeze for 30 seconds for novice, 1 minute for intermediate and 1-2 minutes for advanced. Switch arms. REPEAT TWICE. To be successful, you have to seek out failure. Successful people fail a lot more than they succeed. Failure is where all the lessons are. This is for anything in your life, even at the gym, you’re seeking failure. This is what I train my clients every day at the studio: muscle failure (or success). You take your muscles to the point of failure because that’s where the growth is and that’s where you find strength. Stay tuned for the next blog post to learn more about the workout method that I train. Ludwig Mies van der Rohe, the renowned architect and designer said it best: “Less is More”. Most of you will have heard of “new” minimalist movements, where people live with just the necessities and precious little else. 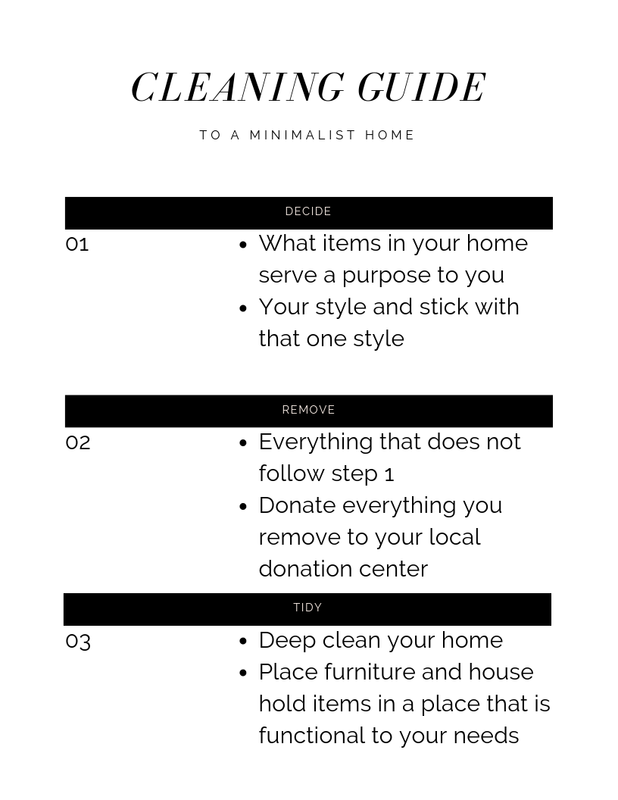 Essentially, living this clutter-free lifestyle is a streamlined way to help you find purpose and be grateful for what you have, whilst giving you room to be creative. I’ll let you into a little secret, this “new” movement, isn’t new at all. In fact, the idea of designing your life, with a goal of simplicity, has been around for a long time. 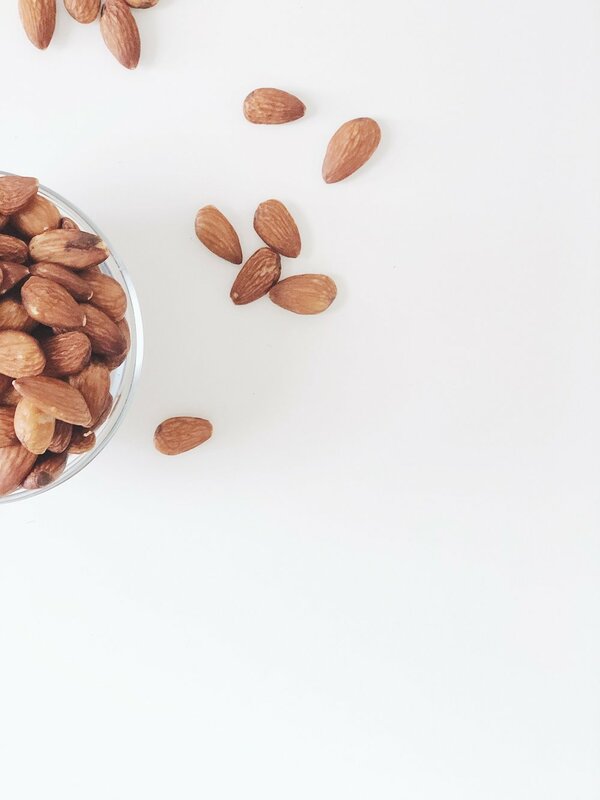 As a personal trainer, I get asked a lot of what my diet consists of and if it’s hard to stick to it. Healthy habits become your lifestyle if you really want it to be part of your life. I believe in creating healthy habits, not restrictions. For instance, if milk chocolate is your weakness, replace it with dark chocolate. It’s a healthier version and since its usually richer, you’re more than likely not going to indulge. Set a certain time for that piece of dark chocolate. I usually have a piece of dark chocolate with a cup of espresso in the late morning or after lunch. Before we begin talking about any more food, ask yourself how much water are you drinking per day? According to multiple studies, the magic number is 100 ounces a day. If you wake up at 6am and go to sleep at 10pm, that’s about 6.25 ounces every waking hour. We’ll discuss more about the importance in drinking plenty of water every day in a future blog post, but for now, let that be your homework and try sticking with it! Set an hourly reminder in your phone to drink water. When it comes to a weekly menu, keep it simple! Don’t overthink it. You want to have plenty of vegetables, lean protein, nuts and fruit and occasionally indulge in some carbs! Don’t beat yourself up for having a whole wheat bagel. Unless you’re diabetic, there’s no need to completely go carb free to have a healthy diet. The newest diet fad is the Keto diet. For the majority of the population, it’s probably not the best diet to follow because it does involve a lot of salty and fatty meats and a lot of dairy. There are studies that show that it helps people struggling with diabetes, epilepsy and nonalcoholic fatty liver disease so I’m not bashing the Keto diet, but I am saying that if its a fad diet, it’s probably not the best diet to follow. Also, follow diets that your doctor and nutritionist set for you. Lunch- Homemade Protein Box (inspired by Starbucks) with 2 Hard Boiled Eggs, 1 ounce of Cheese, Grapes, Apple Slices, 1 TBSP Peanut Butter. The lunches and dinners are easy to meal prep. Highly recommend meal prepping as much as possible because it helps you stick with the meal plan because you’ve made it in advance. The oatmeal breakfasts could be made into overnight oats as well. Get creative with it! Maybe add some chia seeds, greek yogurt and blue berries. This is just a sample of what I usually do weekly because it seems to be the easiest. My husband and I do a weekly grocery shop and have a budget for our groceries that we set. Also, if you have a fitness routine, I recommend having at least 20 grams of protein (either bar or shake…nothing too sugary) soon after your workout. The Merriam-Webster Dictionary defines wellness as “the quality or state of being in good health especially as an actively sought goal”. I truly believe that good health starts from within. You have to be consumed by it. It has to be intwined with every aspect of your daily life. That includes, not only fitness and nutrition, but your mind as well. A healthy mind and body starts with healthy habits. Being a personal trainer, I hear the excuse, “I don’t have time to have a healthy life. I’m too busy and always on the go.” Believe me, I know how busy people are nowadays. I have two full-time jobs, I’m a wife and mother and now I started a blog and I still have time to have a healthy lifestyle. Habits come from daily routines. So, really think about your daily routine. Start by looking at your morning routine. Do you get up everyday at the same time? Do you make your bed immediately and get into the shower? Do you have a shower routine? Etc… Break every minute down and write it down for a week. You’ll soon realise that you probably spend a lot of extra time in front of the T.V. or on your favourite social media account scrolling through for hours and hours. If you really want to start having a healthy lifestyle, you need to prioritise the things that are actually helping you to achieve your goals. Watching 3 hours of T.V. a day isn’t going to help you finish reading that book that you’ve been putting off for months and it’s certainly not going to help you get rid of those extra pounds you put on during the holidays. So, really dig deep within yourself and weed out the things in your life that are not contributing to making you happier and healthier.